This set of photographs is selected from images made on occasional visits to the Tanfield Railway between 2006 and 2014. The railway was originally a wooden waggonway opened in 1725 and is the oldest in continuous operation anywhere. 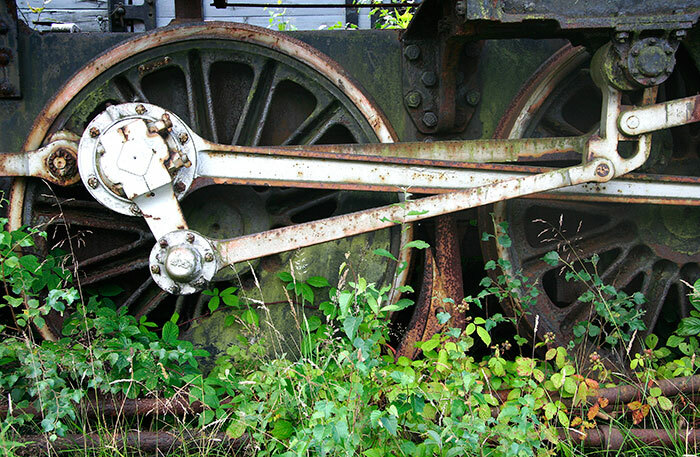 The 1854 Marley Hill locomotive shed is the oldest operating in Europe and retains machinery accumulated between inauguration and the1962 colliery closure plus later acquisitions. This was one of a number of narrow gauge 4-6-2 Pacific locomotives built by Robert Stephenson & Hawthorn at Darlington in 1951 for the Tasmanian Government Railway. It was brought back to England as an example of the many locomotives built in the North-east in bewildering variety for railway companies across the world. The driving wheel spoke design seems unusual. The steel plate locomotive frame shows clearly behind the driving wheels. Being narrow gauge it's a noticeably smaller machine than its British standard gauge equivalents. The flat connecting rods seem very lightweight. 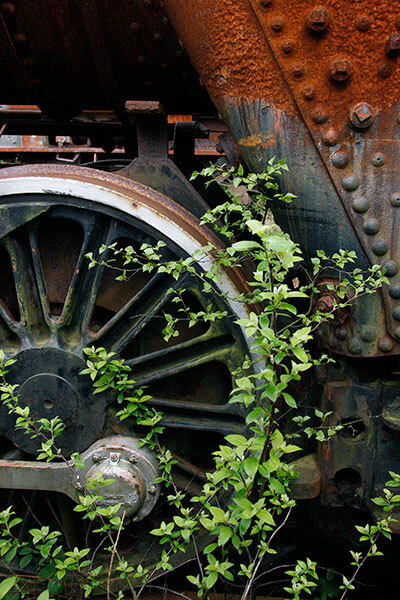 Spring vegetation adds a flash of colour against the dark wheel paint and the red rust of the firebox. 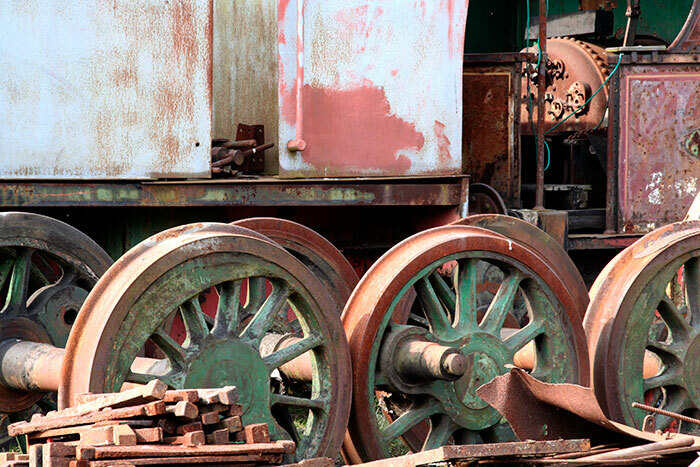 The smokebox, front frame, cylinder covers and the leading wheel bogy of the locomotive stand against the fading but still quite bright paintwork of a mineral wagon. The twin-bogies and frame of the coal and water tender stand nearby without a superstructure. Three locomotives stand on track outside the locomotive sheds and workshops. 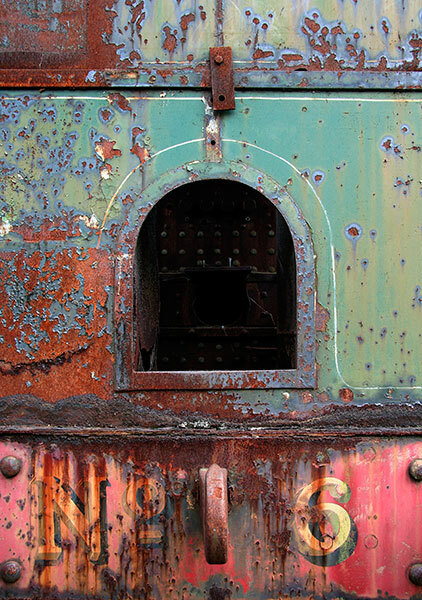 The removal of the sheet steel boiler casing and insulation reveals the junction of the rusting firebox and boiler beneath. Closely spaced rivets hold the constituent parts together. It's part of an 0-6-0 tank engine that's been stored in the open for some time. The suspension leaf spring and hanger seem minimalist in form and metal. 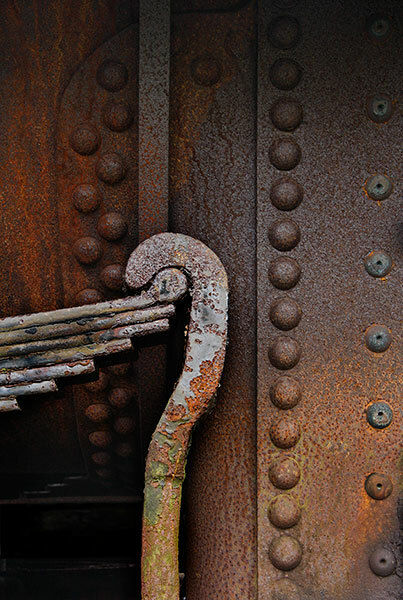 The firebox door is barely visible through this opening in the plating behind the locomotive footplate, purpose unknown. The once bright red buffer beam paint has faded to pink and the main body colour may once have been closer to blue than green. 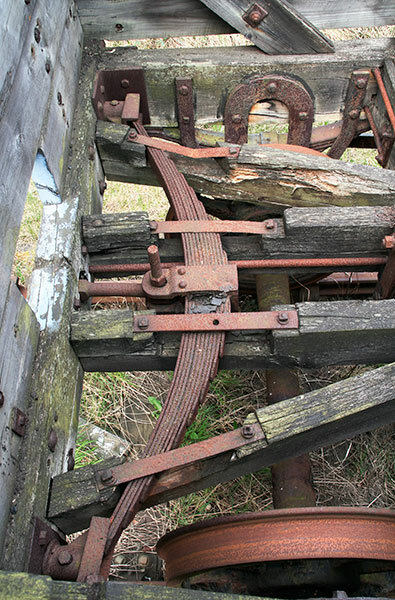 The floor of this open goods wagon has been removed, exposing the robust timber chassis frame and a pair of wheels. The leaf spring is linked to the drawbar and coupling assembly on the outer side of the buffer beam and cushions the forces imposed between vehicles when underway. 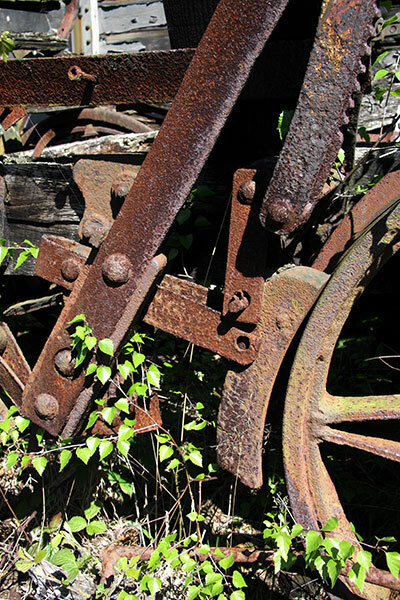 Short wheel base chaldron wagons were once extensively used around collieries. Sloping sides ensured the coal discharged easily through bottom doors. The earliest versions were timber-built, with wooden wheels running on the timber rails of the first waggonways: this later one had metal wheels and chassis. Timber colliery tracks were eventually refitted with iron and then steel rails. The extensive wooden originals excavated in excellent condition at Wallsend in 2013 once linked local collieries to the River Tyne. 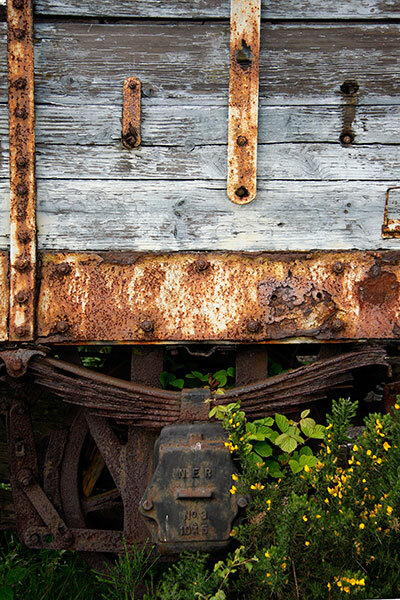 Rust corrosion and pitting has a strong grip on the leaf spring, chassis and timber reinforcement strips on this open mineral wagon built by the North Eastern Railway. The Company joined with others to form the LNER in the railway groupings of 1923. In its earlier days this long wheel base box car would have been operated by British Railways. Grounded off its chassis, it's now used for storage. 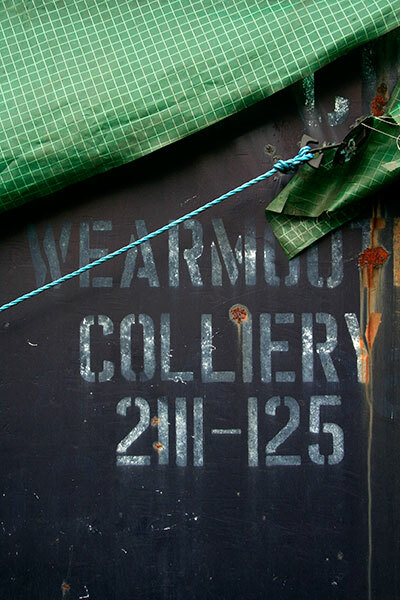 Stencilled lettering identifies the Wearmouth Colliery that once operated close to Sunderland city centre. The roped tarpaulin added an unusual touch. In steam days on public railways they were used to sheet open goods wagons to protect vulnerable freight. 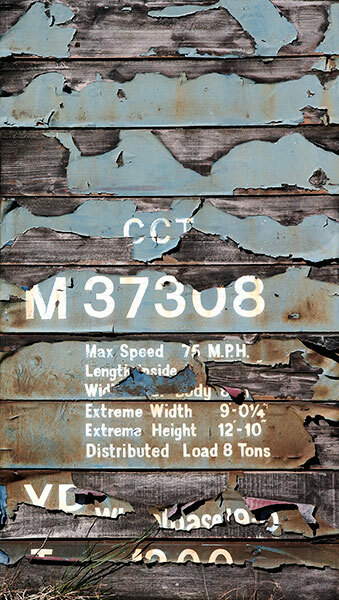 Faded red, yellow and black paint peels away from the pitted red rust on the steel panels of a National Coal Board electric locomotive. It and others were used in coastal collieries around Marsden and South Shields. The NCB operated the Marley Hill locomotive depot until its 1962 closure and subsequent rescue by the railway volunteers. 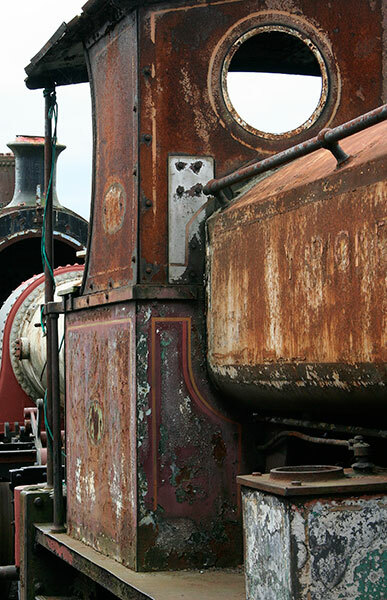 The nearby Bowes Railway working museum conserves a large collection of buildings, locomotives and wagons. A building housing a working incline winding engine is a rare and important feature. 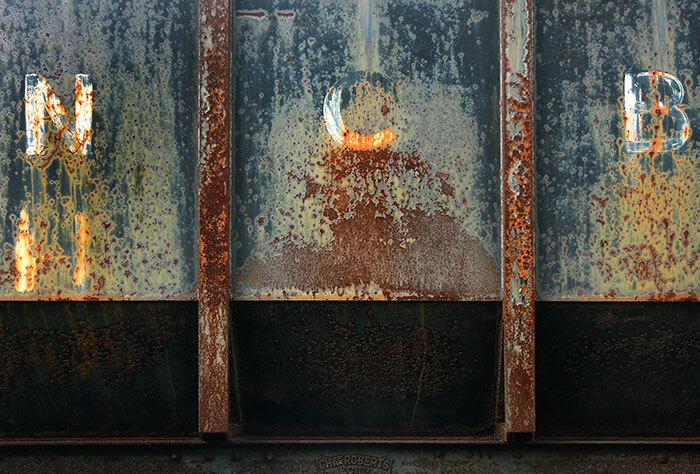 This all-steel hopper wagon is still in good order even if the paint is wearing a little thin. The Railway has a ‘Coal Train' that operates alongside the passenger services on special events days. 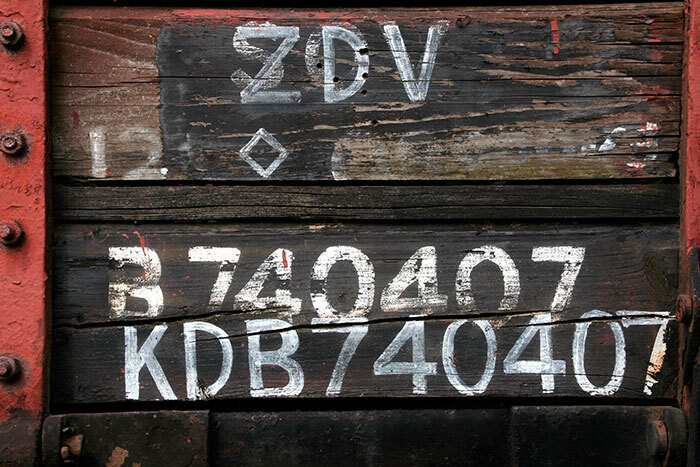 Steam hauled timber and steel wagons of varied vintages are tailed by Guard's Van No.7 that once operated on the local railways of the Lambton, Hetton & Joicey Collieries. 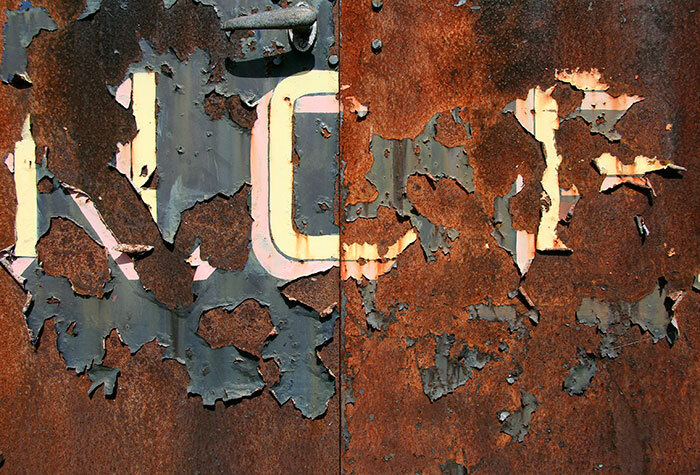 Weathering, rust and decay exact a price from the artefacts stored out of doors. Over the years I've seen specific objects change quite markedly. Sometimes it's further deterioration but sometimes it's complete resurrection and transformation into something as new. Sadly a few go beyond recall and are destroyed. 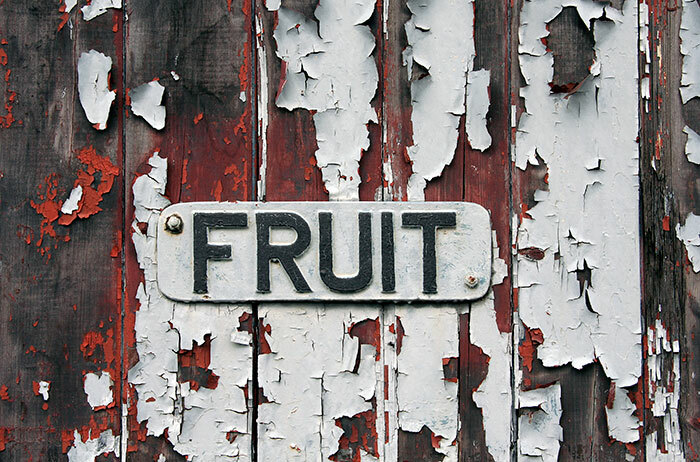 Following painting and renovation a few years ago this fruit box car is in better condition than this earlier image might suggest. I like this image and from time to time seek out the wagon to see how the lettering is faring. 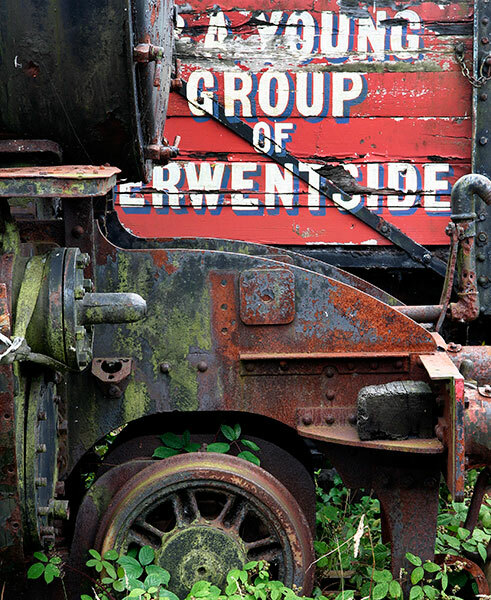 When the Tanfield Railway emerged from the rapidly declining coal industry in the seventies a handful of people determined to preserve something from a traditional way of life. Apart from acquiring the track and original buildings their flair brought together finance, locomotives, rolling stock, an engineering base and people who develop and operate a thriving and popular railway. 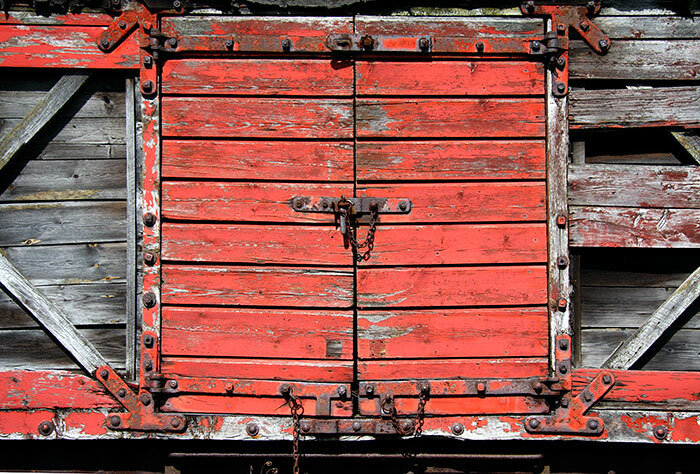 With its fading red paint, depleted planking and rusting iron work this substantially built box wagon could still be restored to use. Most people working at the Tanfield Railway are volunteers offering particular skills from locomotive and railway engineering through train operating to organising special events and much more. What they achieve with talent, enthusiasm and sheer hard work is always impressive. 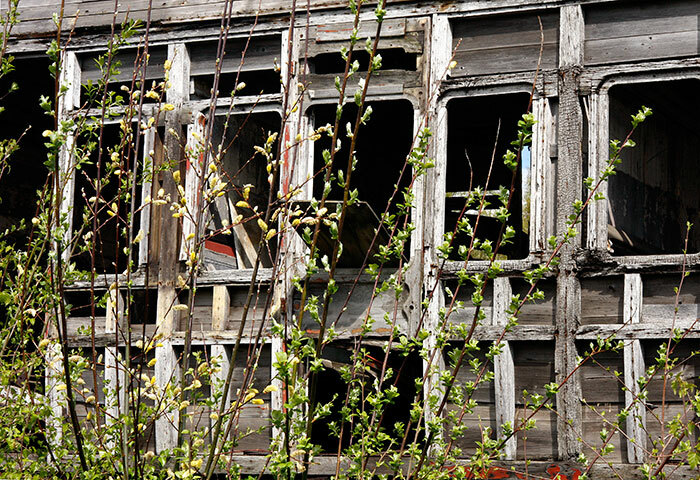 Spring willow stems and catkins stand against the framework of a passenger carriage stripped of its interior and exterior panels. There are others like this as well as better preserved vehicles being worked on or awaiting attention. It gives some idea of the carpentry skills and techniques underlying the pristine paint finish more familiar on the operational passenger carriages.